ATM systems appear to be very secure, but the money can be accessed fairly easily if you know what you are doing. Criminals are exploiting hardware and software vulnerabilities to interact with ATMs, meaning they need to be made more secure. This can be achieved with the help of additional security software, properly configured to stop the execution of non-whitelisted programs on ATMs. 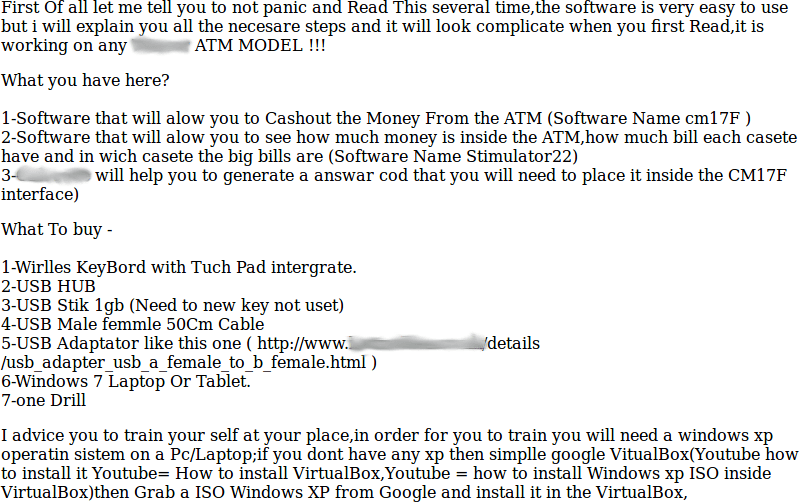 Worryingly, it is very easy to find detailed manuals of ATM malware. Anybody can simply buy them for around 5000 USD on darknet markets. 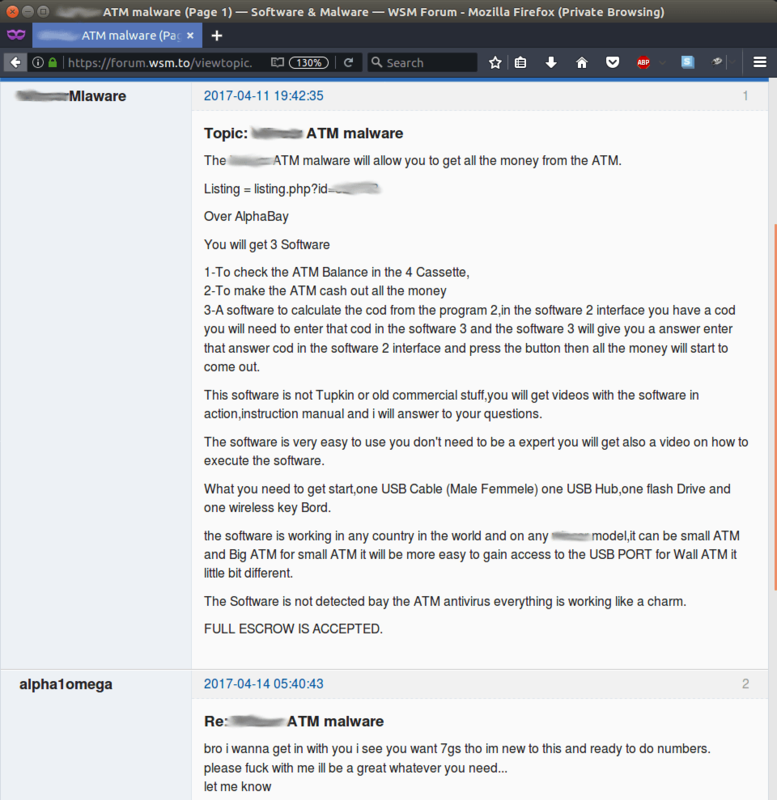 In May 2017, Kaspersky Lab researchers discovered a forum post advertising ATM malware that was targeting specific vendor ATMs. 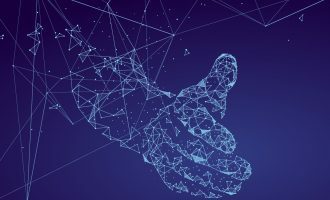 The forum contained a short description of a crimeware kit designed to empty ATMs with the help of a vendor specific API, without interacting with ATM users and their data. 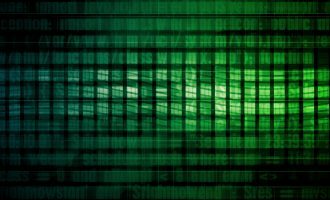 The post links to an offer that was initially published on the AlphaBay Darknet marketplace, which was recently taken down by the FBI. The price of the kit was 5000 USD at the time of research. 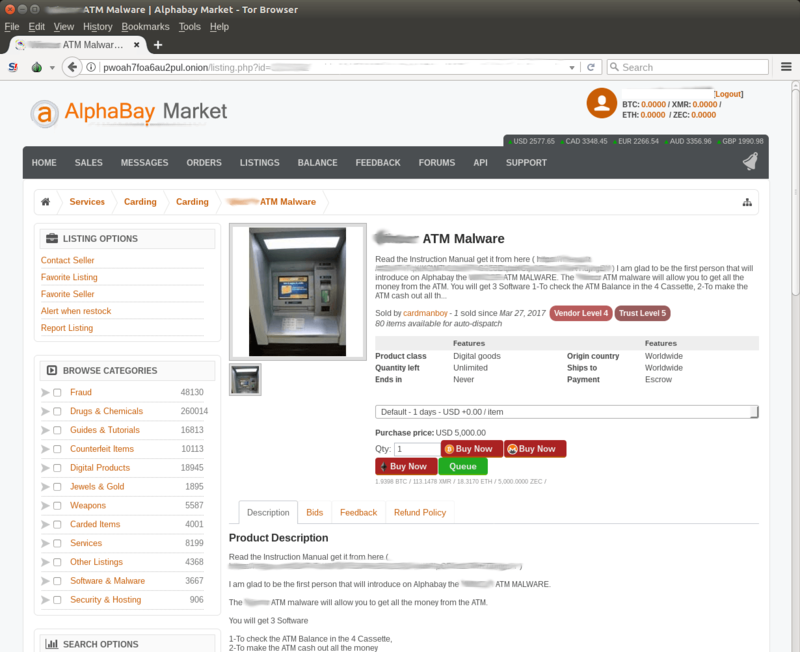 The AlphaBay description includes details such as the required equipment, targeted ATMs models, as well as tips and tricks for the malware’s operation. And part of a detailed manual for the toolkit was also provided. Previously described ATM malware Tyupkin was also mentioned in this text. The manual “Wall ATM Read Me.txt” was distributed as a plain text file, written in poor English and with bad text formatting. The use of slang and grammatical mistakes suggests that this text was most likely written by a native Russian-speaker. Prepare an all tools, all the programs should be placed on a flash disk. Tools are wireless keyboard, usb hub, usb cable, usb adapter usb a female to b female, Windows 7 laptop or a tablet ( to run code generator) and a drill. Open ATM door and plug into USB port. Execute Stimulator to see full information of all the ATM cassettes. 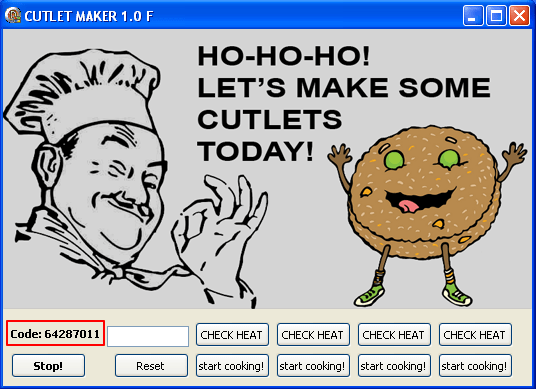 Execute CUTLET MAKER to get it is code. Execute password generator on a tablet or on a laptop and paste CUTLET MAKER code to it, put the result password to CUTLET MAKER. Dispense the money from chosen cassette. The manual provides usage descriptions for all parts of the toolset. The list of crimeware from the kit consists of CUTLET MAKER ATM malware, the primary element, with a password generator included and a Stimulator – an application to gather cash cassette statuses of a target ATM. The crimeware kit is a collection of programs possibly written by different authors, though CUTLET MAKER and Stimulator were protected in the same way, c0decalc is a simple terminal-based application without any protection at all. The first sample was named “CUTLET MAKER” by its authors and has been designed to operate the cash dispense process on specific vendor ATMs. To answer the question of how a cook from the CUTLET MAKER interface and cutlets relate to stealing money from ATMs, we must explain the meaning of the word “Cutlet“. Originally, it means a meat dish, but as a Russian slang term “Cutlet” (котлета) means “a bundle of money”, suggesting that the criminals behind the malware might be native Russian speakers. The “Cutlet Maker” malware functionality suggests that two people are supposed to be involved in the theft – the roles are called “drop” and “drop master”. Access to the dispense mechanism of CUTLET MAKER is password protected. Though there could be just one person with the c0decalc application needed to generate a password. Either network or physical access to an ATM is required to enter the code in the application text area and also to interact with the user interface. Stimulator was possibly developed by the same authors. 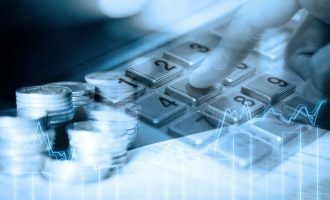 Its purpose is to retrieve and show the status information of specific vendor ATM cash cassettes (such as currency, value and the amount of notes). CUTLET MAKER is the main module responsible for dispensing money from the ATM. The sample analysed in this research has the MD5 checksum “fac356509a156a8f11ce69f149198108” and the compilation timestamp Sat Jul 30 20:17:08 2016 UTC. 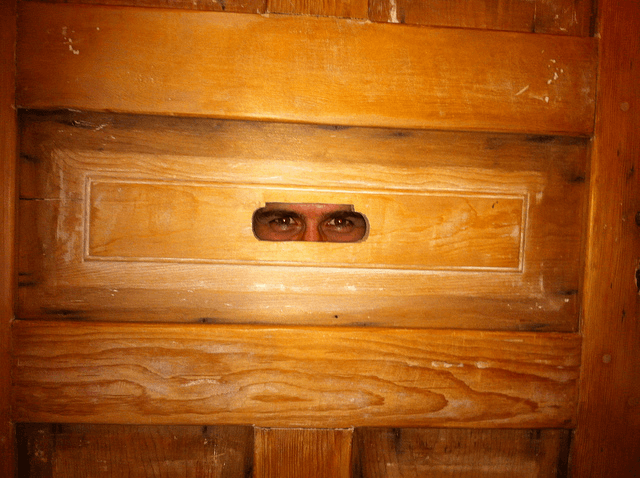 The program is written in Delphi and was packed with VMProtect, however it is possible that multiple packers might have been used. 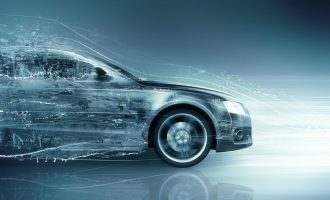 Different versions of the main component were found while researching this toolset. The first known submission of the first version sent to a public multiscanner service took place on June 22nd 2016. 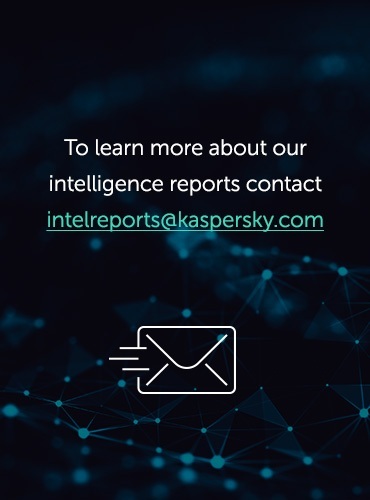 All submissions discovered by Kaspersky Lab were performed from different countries, with Ukraine being the chronological first country of origin. The assumed development period is from 2016-06-22 to 2016-08-18, according to the first submission date of the earliest version and the last submission date of the latest version at the time of writing. The application requires a special library to operate, which is part of a proprietary ATM API, controlling the cash dispenser unit. With all the dependencies in place, the interface shows a code. In order to unlock the application, a password from c0decalc generator needs to be entered, thereby answering the given challenge code. If the password is incorrect, the interface won’t react to any further input. Each “CHECK HEAT” and “start cooking!” button corresponds to a specific ATM cash cassette. Buttons labeled “CHECK HEAT” dispense one note, “start cooking!” dispenses 50 “cutlets” with 60 notes each. The “Stop!” button stops an ongoing “start cooking!” process. “Reset” is intended to reset the dispense process. 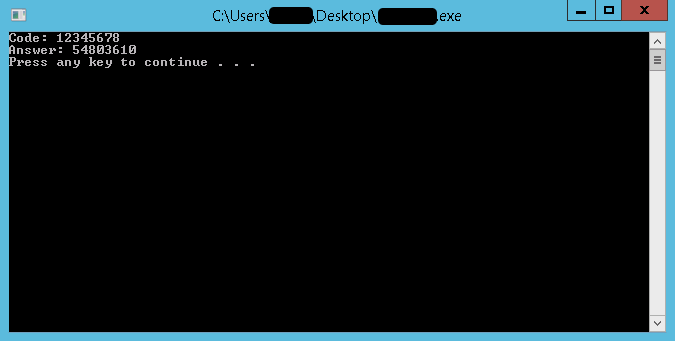 This tool is an unprotected command line application, written in Visual C. The purpose of this application is to generate a password for CUTLET MAKER’s graphical interface. The compilation timestamp for this specific sample is Sun Nov 13 11:35:25 2016 UTC and was first uploaded to a public multiscanner service on December 7th 2016. Kaspersky Lab researchers checked the algorithm during the analysis and found “CUTLET MAKER” working with the passwords generated by “c0decalc”. The Stimulator sample analysed in this research has the MD5 hash “27640bb7908ca7303d13d50c14ccf669”. This sample is also written in Delphi and packed the same way as “CUTLET MAKER”. 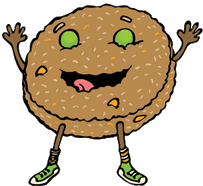 The compilation timestamp is Sat Jul 16 18:34:47 2016 UTC. The application is designed to work on specific vendor ATMs and also uses proprietary API calls. Each column, shown in the picture above, describes the state of one corresponding ATM cassette. This type of malware does not affect bank customers directly, it is intended for the theft of cash from specific vendor ATMs. CUTLET MAKER and Stimulator show how criminals are using legitimate proprietary libraries and a small piece of code to dispense money from an ATM. Examples of appropriate countermeasures against such attacks include default-deny policies and device control. The first measure prevents criminals from running their own code on the ATM’s internal PC. 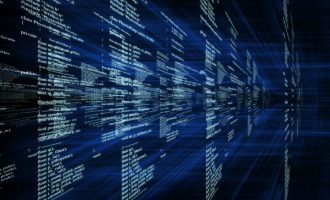 It is likely that ATMs in these attacks were infected through physical access to the PC, which means criminals were using USB drives to install malware onto the machine. In such a case, device control software would prevent them from connecting new devices, such as USB sticks. 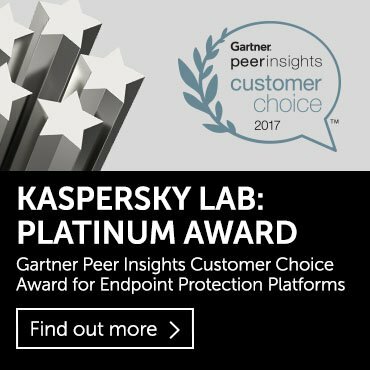 Kaspersky Embedded Systems Security will help to extend the security level of ATMs. well cutlet(کتلت) is an Iranian food..so I guess the author was not actually Russian….and you se the app saying lets cook some culet with that picture that somehow looks like a cutlet… anyway I say that’s an Iranian.